Jumping off buildings safely has come on ‘leaps and bounds’ since power fans have been added to the equation. Allowing safe jumping on a wire with a steady arrival at the bottom also makes, what seems like a huge challenge, more achievable! It doesn’t help one bit with fighting the demons in your head though! I had done a smaller Powerfan jump in the past at the Vivary Adventure and High ropes centre in Taunton, but not quite on the scale of 125 feet! So when asked if I would like to do a jump at the Bodyflight centre in Bedford, I couldn’t really say no! It was also a nice way to cross off another activity on my Challenge200! Donna Jordan from Carpe Diem Fitness organised this trip, and across the group we had people with a real mix of confidence levels. 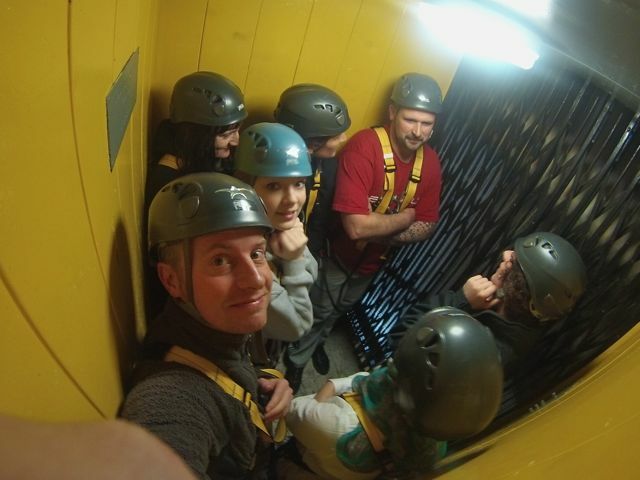 Some in the group were, quite frankly, terrified. 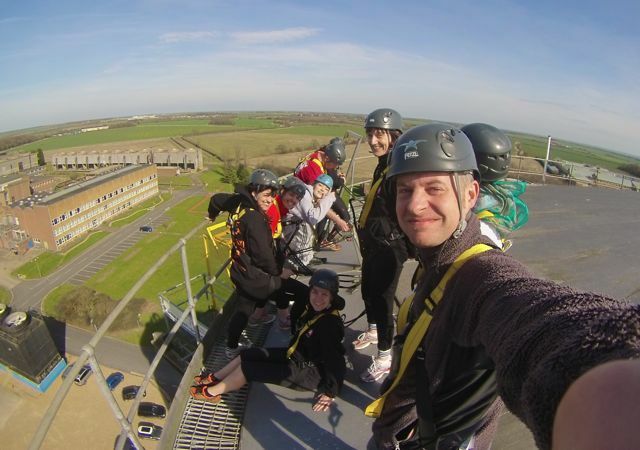 So for them to actually jump off was not only going to be a thrill and a buzz, but a real achievement! Battling your natural survival instinct and to make yourself jump off a building is a very strange position to put yourself in, your body is saying no, but you know your going to feel great on the way down and shortly afterwards! Your are essentially fighting with yourself! The Bodyflight centre’s power fan jump is called “Bodyflight Vertigo” and is at a height of 125 feet or 30 metres in new money. On arrival you really can’t miss it as you park in front of the towering building, quite a way to be introduced to it, and definitely got everyone in the group excited. After a briefing, we headed up in a lift, climbing a few stairways and arrived on the building roof with our first view of the jump we would be doing. I have to admit, standing on metal grating with a 125 foot drop below you was rather un-nerving, and when the first person backed out of the jump, I did have a bit of a sweaty palm issue going on and a slight buzzing in the tummy! I think the waiting around for others to jump was the worst part for me, my advice, go first and don’t think twice about, just jump! The first of the really nervous jumpers jumped to a roaring cheer, great support for what she had achieved, and judging by the screaming and cheering when she arrived at the bottom, she was over the moon with what she had achieved. This one jump may well have spurred the now two jumpers who had backed off, onto doing their jumps shortly after me, taking confidence and support from the others. It was then my go, again when I do something like this, I try not to think about where I’m heading and more about enjoying the moment. Safely attached, a stepped off the platform. The feeling of free-falling towards earth is something you can only really know when you have done it, but as best as I can explain it is that your hold body is alert, alive, reacting and as you arrive at the bottom relived! What a buzz, and so glad I decided to take part! Maybe I’m getting soppy as I get older, but sharing the experience with people who had overcome a fear so big in their heads, was the icing on the cake and really made it a special day! A lovely group and bound by a single jump off a building!